Asemic texts appeared often here and there over the course of the 20th century. Then, at the very beginning of the 21st, it seemed that a consistent part of artists/writers, all over the world, started focusing on it. It isn’t the occasional appearance of asemics in a wider context of art, but it seems now a specific practice or current. Do you agree? I do agree with you. Despite asemic writing is still part of a wider context of text-based art (concrete poetry, vispo and so forth), it has developed its own peculiarity because of its sprouting at the crossroads of consciousness and unconsciousness. If you think of more or less recent experiences involving supervised or unsupervised algorithms to improve machine learning performance, asemic practices seem to insist on the subtle capability of human brain to intercept seemingly familiar symbols, text-segments, scribbles and reinterpret them into new original contents. In my opinion, this may be a contemporary approach to most topics appeared here and there over the course of the last century. Do you think that in the foreseeable future the level of reflection on the existence of asemic writing will increase significantly? On what do you base your answer? It will, as you have properly pointed out. The proof of this may lie in the increasing number of both electronic and traditional publications dedicated to asemicism. The gap between visual experience and reading experience, in both the real and the virtual world, needs to be conceptually reframed and filled. What general themes or topics runs through your portfolio and why have you chosen to address these themes or topics in your asemic art? All series fall within one general issue: language as a boundary zone; even more specifically, language as a habit of reality. Different themes are sort of pretexts to investigate it. As of now, I have been working with SJ Fowler on a liner note sketchbook for Charles Mingus’ Pithecanthropus Erectus jazz suite. How different is the process of creating asemic writing to the creation of traditional writing or art? The main difference lies in the fact that you have to be meaningful, while dropping conventional signs. In some respect, it’s like writing a sheet music for people who do not know how to play it, in such a way that they can experience some musical feeling. What specific influences caused you to develop your particular style of asemic writing? During the ’90s, at University, I was fascinated by both certain weird error-pages printed by old dot matrix machines, and the noisy patterns produced by atomic force microscopes – if you check my portfolio, you find works which might be mistaken for images of surface scanned samples. Then I started studying both Henri Michaux’s narrative lines and Marcel Broodthaers’ conceptual targeting, trying to combine them into what I often label “asemic interferences within concrete structures”. In what ways can attempting to classify asemic writing as a new type of visual poetry provide an interesting perspective on studying the history of visual practices and reinterpreting this heritage from the asemic point of view? New interesting perspectives may be opened up by the development of entirely new theoretical tools, in the same way as Literature benefited from the advances in Physics and Psychoanalysis at the beginning of the last century. The recent investigation of the psychological effects of brief asemic activities, stimulated in individuals with schizophrenia may be quoted as an example of what I mean. But even more amazing, though outside the asemic context, is the case of some medieval novels about journeys to the afterlife which, interpreted by the light of Einstein’s Relativity, revealed unexpected clues within the original plots. Some authors think it can be said that something like an actual asemic “movement” is growing. Do you think so? Or do you think there’s simply a wide constellation of different individuals, far from being defined a movement? Since this wide constellation of artists is more and more organizing itself on the net, through groups, platforms, journals and blogs where images and theoretical papers are shared (The New Post-Literate, Brave New Word, Utsanga, Internet Void, Asemic Front, Nokturno, Otoliths, A-Minor, AOM, Zoomoozophone Review, Asemic Magazine, just to name a few ones), a real movement may be finding its own way. Are you planning any exhibitions in the near future, if so, where and when will the exhibition be held? At the moment, I am just working over new pieces, showcasing them through Behance and Saatchi, publishing them in print and online journals. I have just taken part in a couple of exhibitions in Rome and Turin. Though I am not planning anything in the near future, my studios, in Italy and Germany, are open to visitors interested in seeing the works in real and talking about art. How would you personally define asemic writing through your experience with it? Over the last couple of years, I have addressed the core of asemic writing from quite different perspectives. I would here quote one of the most stimulating: the outstanding realism of language is replaced and neutralized by the absolute equilibrium of writing. Think of staring at a landscape in the fog: at first glance, you guess birches, roofs and so on. As you look back, after looking away, what was a birch may have become a beech, what was a roof may now look like the back of a wolf and so forth. What were the circumstances that introduced you to this art form and what drew you to become involved with it? With the worsening of my calligraphy taking notes at University, I got attracted by that misleading net of signs my papers were slowly turning into. I realized I could get to the bottom of what was written there, just because I somehow knew what I was writing about. Yet, the overall impression of those sheets crammed with lines led me to think that they might have been much more meaningful than I could decipher. That was probably one of the starting point. Why is it that asemic writing cannot be defined as either visual art or writing? Think of the boundary between noise and music: where would you put the chirping of cicadas? Some say it’s music, some say it’s noise, but they must both agree that it’s a sound wave. 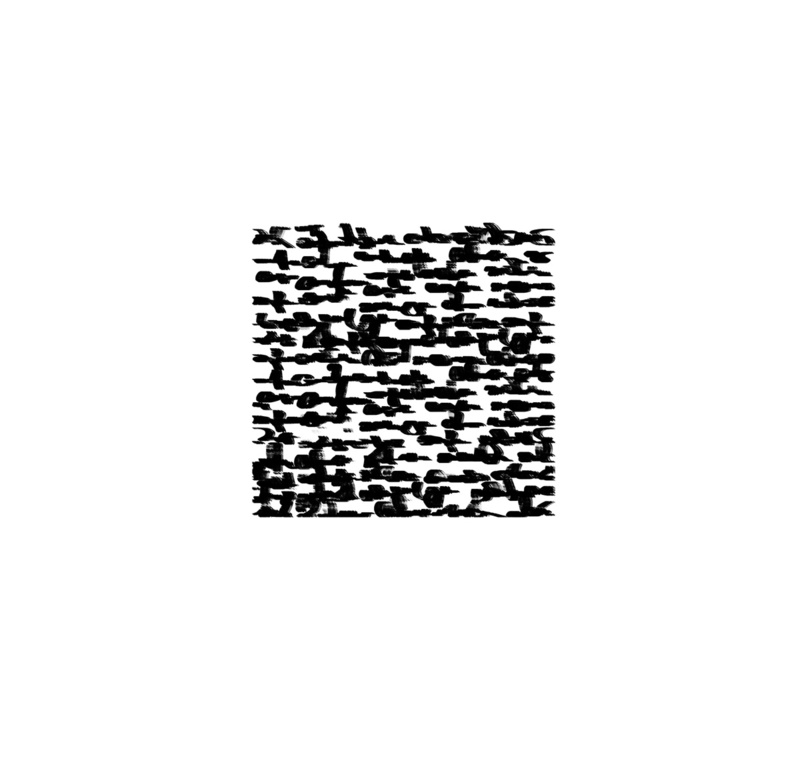 This is asemic writing: some sort of semiotics vibration. When completing your pieces, what emotions or thoughts envelop you when seeing its finished state for the first time? What fascinates me the most is to feel as a bystander before lines and fragments which still retain some narrative, though reshuffled into macro-structures. Which of your projects are you personally the proudest of and what can you share in relation to the creation of it? Instinctively, I would say the project exploring asemic interferences within concrete structures, because of its cross-genre approach: asemic writing is somehow forced to cope with or work around more recognizable patterns. Anthologies, exhibits and web pages collect very different kinds of asemic works. Some of them resemble scribbles and calligraphy, so they fit the definition of “writing”. Others do not, since they include recognizable letters and symbols, or abstract art. Do you think asemics can include these areas or not? Why do you say so? Although purely asemic works do not usually include recognizable symbols precisely to avoid misunderstandings, primary signs may occasionally find themselves merged with already informed ones, as if partially ground by the same machine of enunciation. In any case, the strong relational force between the two sets of signs is predominant and shifts the focus over the thing to be subtly “communicated”. What are your thoughts on the political potential of asemic writing? Like most languages, asemic writing is not politically engaged by its nature. Nonetheless, one might devise how to encrypt messages and bypass censorship, for instance. What are some of the misconceptions people have about asemic writing? Asemic writing’s detractors often insist on the seeming randomness of the collapsed writing. Details seem to get blurred, the old automatic processing of symbols fails. Asemic texts are flickering pointers, muted enunciators, not oriented semiotic segments, challenging the reader to renegotiate an active relationship with the text itself, hanging in the balance between reading and watching but contrasting both. In what ways is the practice of asemic writing different from visual poetry? From a historical perspective, visual poetry was the natural outcome of concrete poetry, in the same way as asemic writing may stand one step beyond visual poetry, without breaking with it, though. In my opinion, the most distinguishable trait is the focus on retaining the textual impact of the macro-structure, rather than developing substantially independent patterns. Do you expect that a reader’s sense of meaning will be derived intuitively when he or she read your writings? With asemic writing, authors become antennas scanning noisy signals, wherein meanings tend to interfere destructively. The combined role of viewer and reader will eventually lead to some unprecedented deconvolution later on.